Just recently I was in the bookstore in search for a calendar when I stumbled across adult coloring books. They are suppose to be the rave these days, so I know you already know about this. Even with its ridiculous cost, I think its great that not so artsy people have taken an interest in this new trend and added color to their lives. Whether your miniature creative pursuits are: Legos, puzzles, ceramics, glass blowing, painting, etc. Adding art to your life has a way of expanding into other areas like visualization, and imagination that can give you that bust you need on days that seem to just drag along. 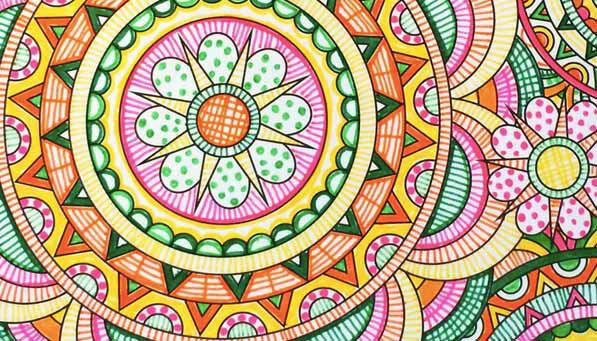 A few nights a week, I look forward to curling up on the couch with my ever-growing collection of colored pencils, tuning in to the latest episode of Serial, and scribbling away at mandalas and Harry Potters — but I still find the trend strange. I’ve always had a penchant for making new things from scratch — painting, knitting, writing, drawing, baking. But with my coloring book, I’m not really creating anything. The designs are already on the page — I’m just filling in the white spots. And yet the activity is just as soothing to my mind as my more traditionally “creative” hobbies. So what is the psychological draw of a task that feels creative, but doesn’t actually involve creating anything new?